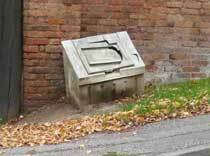 Civic Voice, the national umbrella organisation of civic societies throughout Britain, has initiated a campaign to reduce street clutter; picking up on DoT official policy in their Manual for Streets 2007. This has been supported by the new Government in a letter to Local Authority Leaders. The Society decided to take part in the campaign and formed a sub-committee comprising Barry Austen, Peter Kent, Vanessa Johnston, David Willetts, Eddie Patterson and Peter Scorer. The first step was to agree a methodology and to carry out a survey. It was decided that this would be confined to the main roads in Southwell. • Several signs obscured by foliage. Greater care in the application of many of the signs could have saved money. 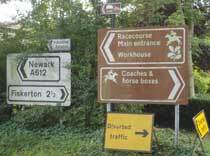 We are currently negotiating with Newark and Sherwood District Council over advertising banners, signs in the car parks and non-compliant shop signs. We are also negotiating with Nottinghamshire County Council over street signs and pavement signs. In view of current budget constraints we realise that this may be a long term process. It is possible that money could be found locally for the work which could be undertaken with the approval of the County Council. We are investigating this possibility.